In all my excitement over green piña colada smoothies, I forgot to mention the highlights of birthday week! Don’t worry, the rice and bean stuffed peppers will still be here when I’m done. I turned 30 on Sunday! Why is there not a way to capitalize numbers? Because those two fateful digits deserve some major emphasis. I didn’t feel the need to get all crazy with some co-ed pseudo bachelorette-like hurrah. Like I’ve said before (in real life, and maybe somewhere on this site), I’m totally at peace with, even excited for, 30. I am not one of those people who peaked in high school or college or my mid-twenties, and when I hear people say that any of those periods were the best of their life, my internal reaction is usually pure horror. Like, what if high school WAS the best time of my life??? What does that mean for the sixty remaining years? I don’t wanna know. I know there will be some naysayers out there, and if you are one of them who did, indeed, revel in the freedom of relative youth, where you made some of your best and lasting friendships, that is truly awesome. It just hasn’t been my path. Day-to-day I despise change, but long-term it’s my friend. I can depict distinct seasons throughout my life, and most often, they keep getting better. I learn some lessons, then make a 180 (or at least like a 107) degree shift to put them into practice and see what’s next. I am 100% FOR SURE doing some learning in life right now, but I’m also about to marry, and don’t argue, the world’s best male. Every day is literally an hourly struggle in time management and career path, but on the flipside, a little part of me is just slightly starting to feel at home in Connecticut. Long story. We’ll save the full version for another day. Anyway–birthday highlights! Thank you so much if you were among those who showed me birthday love via facebook, text message, phone call, or blog post comment. I’m not big on lengthy responses, but I do read and appreciate every last (drunken) one. My lack of response is due mostly to the fact that I was busy being spoiled rotten by Steve. This, also, is a topic for another post, but, following mid-week eighth row tickets to U2 in NYC, he outdid himself with rooftop cocktails on a gorgeous day, then dinner at…wait for it…Le Bernardin. Dream. Come. True. Artichokes, risotto, smoked trout, potato chips (! ), chanterelles, some strange French version of casserole, cherry everything, two desserts, and a broken champagne glass (not mine!). I’d say it was a good night. Sunday, my actual date of birth, I broke Steve’s streak of never seeing his Mets win at home at a swampy hot game during which we were too overheated to even consume a hot dog. Instead, we subsisted on 25 ounce Bud Lights, which turned out to be quite hydrating. After 47 minutes in the sun, lukewarm beer doesn’t taste as good as water, but it did help me forget about sweating from weird places. 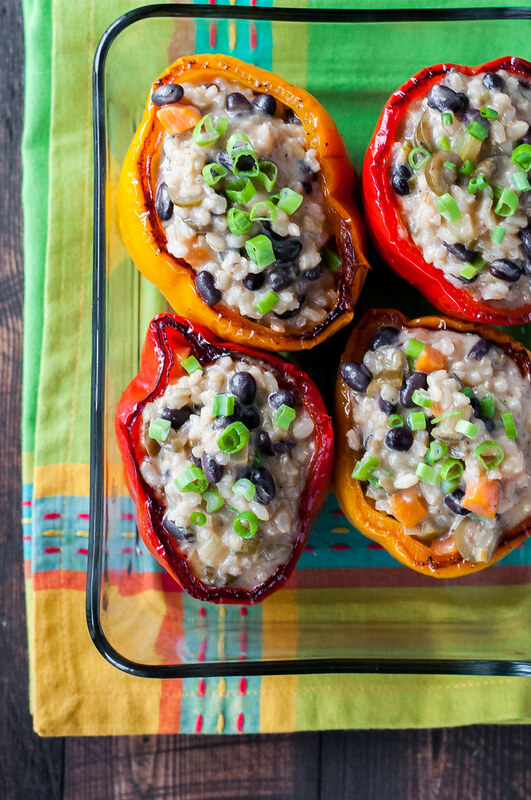 And with that gross detail, let’s shift gears to cheesy rice and bean stuffed peppers. In a past life, I was really bad at stuffed things, like peppers, squash, and zucchini, mainly because I didn’t have the hang of properly roasting the recipient vegetable so that it would have that nice caramelization but not be mushy and overcooked, unable to hold its structure beneath the weight of the filling. After several unattractive attempts and Food Network episodes on the topic, I’m a skilled professional. See those nice dark golden edges of the peppers? Yep, that was me, no research required. Basically, it comes down to this: be generous with oil and seasoning and make sure to get the vessel veggie nice and hot near the bottom of the oven, browning the outside before the inside has a chance to overcook. To take advantage of the 20 minutes spent roasting the bell peppers, I got some hands-off, oven-baked risotto filling going at the same time. 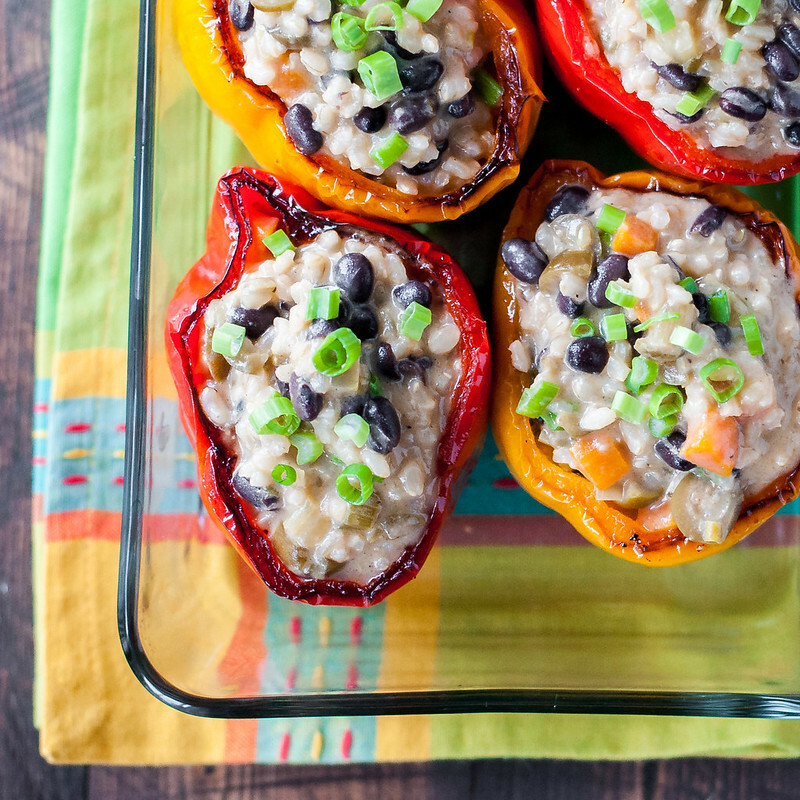 I knew I wanted a creamy filling for these, and what better way to achieve that than with risotto? But standing over the stove for 45 minutes in late summer? No thank you. After checking out a few recipes for baked risotto, I came up with my own hybrid. I decided to spend a little time on the stovetop softening my aromatics for tons of flavor, toasting the rice in the traditional risotto method for the best texture, and giving the rice a head start on cook time by getting it to a quick stovetop boil. All that takes about 10 minutes, and then the risotto goes into the oven, freeing you of the kitchen for 30 minutes! If that’s not enough for you, these bad boys can be prepared and assembled a couple days in advance. 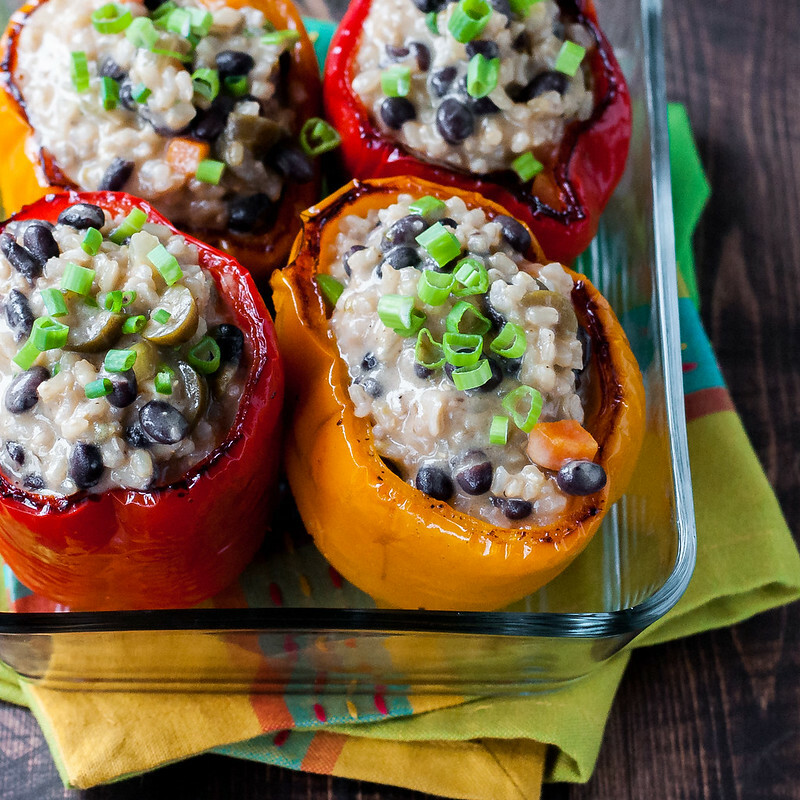 Thanks to all that cheese and creaminess, the assembled peppers should freeze well, and they’re included in the freezer friendly section of this list of healthy summer dinners. 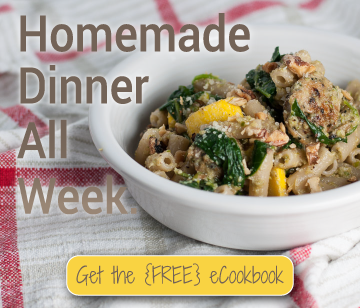 For a week’s worth of stovetop summer dinner recipes not even available on the NCK blog, make sure to grab a copy of my eCookbook. It’s free when you sign up for weekly, non-intrusive email updates from NCK. A meatless dinner recipe that looks fancy but is all about giving you free time. 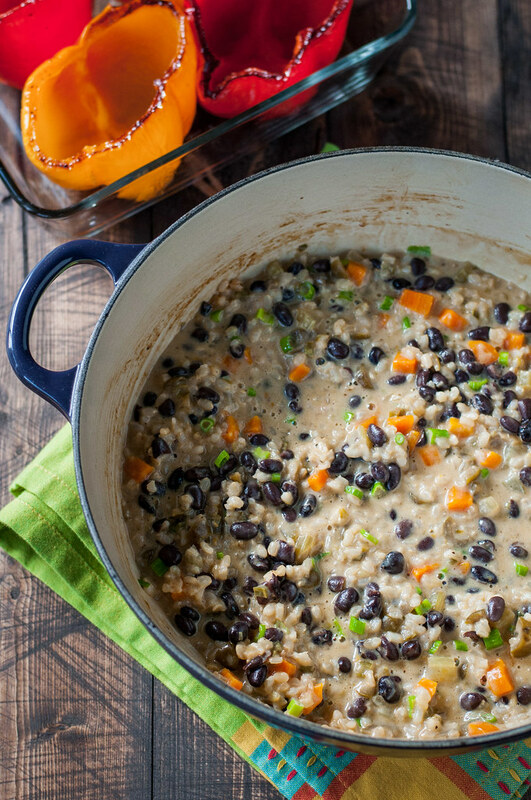 Creamy brown rice and black bean "risotto" bakes in the oven while bell peppers roast, leaving you with at least 30 minutes to fold laundry, check emails, or relax with a beverage. 1 15 oz. can black beans, drained and rinsed. Preheat oven to 400 degrees (F). Cut tops off of bell peppers, leaving most of the pepper intact, and remove seeds and membranes by hand. If desired, chop the tops of 1 or 2 bell peppers and add them with the scallions and other aromatics, later. Rub cavities, exterior, and cut edge of peppers with a thin coat of olive oil (1/2 to 1 tablespoon) or spray them all over with olive oil cooking spray and sprinkle with pepper. Place cut side down on a rimmed baking sheet and set aside. In an medium, oven-safe Dutch oven with a lid, heat a tablespoon of oil and all the butter over medium until butter melts. Add scallions (white and light green slices), jalapeño, carrots, celery, and garlic and cook, stirring frequently, until softened but not browned. Reduce heat slightly and add rice. Stir constantly for 1 to 2 minutes until rice turns translucent around edges. Add broth, raise heat, and bring to a boil. Just after rice boils, remove from heat, stir, and cover. Carefully transfer to upper middle oven rack. 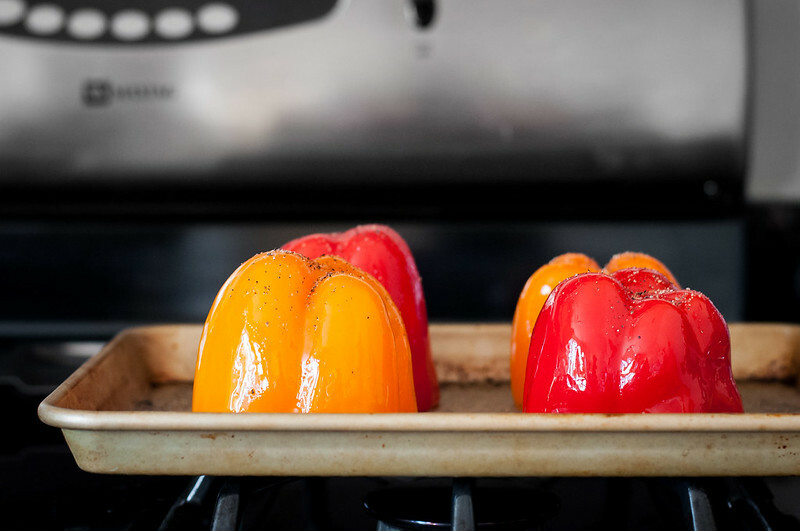 Place tray of peppers near the bottom of the oven. After 20 minutes, remove peppers and allow to cool. They should be crisp-tender and not so soft they collapse. Stir rice and continue cooking, covered, another 10 minutes. Meanwhile, place peppers cavity up in a baking dish which holds them upright. Season inside with salt and more pepper. After removing rice (it may still be a bit soupy), allow to stand, covered, for 5 minutes. Taste for doneness--the rice shouldn't be tough, crunchy, or chewy, and most of the liquid should be absorbed. Stir sour cream, cheese, beans, olives, cilantro, vinegar, and salt and pepper to taste into the baked rice. Spoon rice and beans generously into peppers and sprinkle with a little more cheese, if desired (not pictured). Bake 5 to 10 minutes until warm. Serve topped with sliced scallion tops. I developed the recipe using brown rice. Cooking time should be about the same for arborio rice, but it may vary slightly. You can save the bell pepper scraps from the discarded tops for a snack, or dice and sauté with the other aromatics. The recipe is gluten-free and vegetarian. To make up to 48 hours ahead, assemble stuffed peppers, don't top with cheese, and keep refrigerated. Let stand 30 minutes at room temp, then bake at 350, covered, until heated through (start with 20 minutes). Sprinkle with extra grated cheese, if desired, and bake the last few minutes uncovered to melt. Note: This page contains affiliate links. It does NOT contain sponsored content. Affiliate links (to products I recommend, on Amazon) offset my ingredient and website maintenance costs, so I can keep bringing you family-friendly recipes like this one. Thanks! These peppers look gorgeous and so delicious! Haha yes, I try to forget about those aspects, but otherwise it’s all uphill!